As a testimony to the worldwide reach of the royal wedding, we were able to watch the wedding from Israel on two local channels with live feed and Hebrew commentary. Everything was stunningly impressive. It appears to be one of those occasions where people will say, 'you had to be there'. The Bishop of London's sermon was profound and insightful for the coming generation. The Lord's prayer, textually, preserved English 'trespasses' and kept to the short Matthean form. One question of protocol as seen from "outside", I noticed that the couple went around to the right of the centerpiece in the aisle while leaving the church, but the carriage properly followed to the left of the traffic circles on the way to the palace. May the blessings and vows spoken during the ceremonies be fulfilled, for the new Duke and Duchess of Cambridge and for all the witnesses. Some very nice pictures from The Seventh Birmingham Colloquium on the Textual Criticism of the New Testament held in Birmingham in March 2011 has been placed on-line at the ITSEE website. You can judge from the third picture how much I enjoyed the atmosphere. One of the highlights was the skype session with Amy Donaldson who presented from the other side of the Atlantic Ocean (pictures in rows 13-14). Pictures from the excursion to Lichfield Cathedral and its treasures are found in rows 8-10 (including the Chad Gospels). Special thanks to photographer Edgar Ebojo. 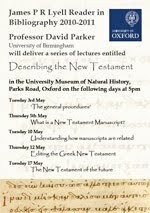 I take the opportunity to mention that Birmingham professor David Parker will hold a lecture series (Lyell Lectures) entitled "Describing the New Testament." Thursday 5 May 2011, What is a New Testament Manuscript? Yesterday, following in the footsteps of co-blogger Christian Askeland, our guestblogger Myrto Theocharous successfully defended her University of Cambridge PhD dissertation entitled "Lexical Dependence and Intertextual Allusion in the Septuagint of the Twelve Prophets: Studies in Hosea, Amos and Micah" (supervisor: Professor Robert Gordon). During last year Myrto offered summaries and reflections on the eight essays in Internationale Fachtagung veranstaltet von Septuaginta Deutsch (LXX.D), Wuppertal 20.-23. Juli 2006 (WUNT 219; Tübingen: Mohr Siebeck, 2008). Apparently, N.T. Wright has prepared a new translation of the NT, "The King’s Version: A Contemporary Translation of the New Testament" to be released in September by HarperCollins (HT: Euagelion). Clayboy assumes that Wright has simply extracted the working translation of the New Testament he developed in his “for everyone” commentary series. I do not know whether and to what extent Wright's translation work involves any text-critical decisions. This preliminary apparatus is a companion to the recently published Novum Testamentum article by Georg Gäbel, "The Text of P.Oxy. 4968 and Its Relationship with the Text of Codex Bezae" (see further discussion and links here), showing the evidence from full collations of all manuscripts included in the ECM of Acts for the portion of text contained in Papyrus 127, i.e., Acts 10:32–12:9; 15:29–17:10. There is more explanation to the apparatus here. A recent comment over at the Amsterdam NT Weblog reminded me of our old conversation on this blog (now years ago) about what is “evangelical textual criticism” and how does it differ from textual criticism proper. On some occasions I have thought of writing on this subject, e.g., when I read a brief passage in David Parker’s An Introduction to the New Testament Manuscripts and Their Texts (CUP, 2008), especially since I haven’t said much on the topic myself (in contrast to other ETC bloggers). The obvious significance of the connection between one’s wider understanding of history and human society and one’s attitude to textual criticism will be more clearly illustrated to someone working in the theological milieu by examples of a quite different point of view. It approaches the task of identifying the words given by God with reverence and therefore caution. It approaches the task of identifying the words given by God with a confidence in God’s provision. Members of this blog represent a variety of approaches by evangelicals, and that’s how it should be. There are various possible interpretations of the evidence that are compatible with historic evangelical theology. However, there are also some approaches that do not sit well with such theology (and scholars will therefore either challenge the approaches or the theology, or both). Thus we may at least define our approaches negatively: they are not X, Y, or Z. For instance, Von Soden’s preference for ‘Joseph begot Jesus’ in Matthew 1:16 on the basis of the Sinaitic Syriac was wrong philologically, but even before a demonstration of its philological error was available, it looked wrong-headed to evangelical (and other) theology. 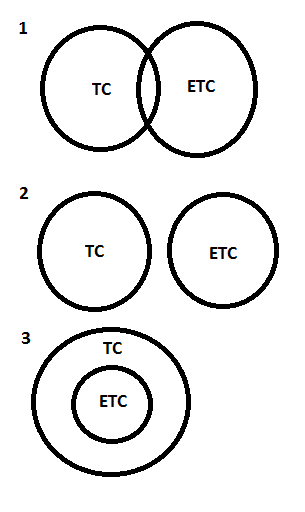 If a site like ETC is to have a goal it should work toward a consensus among evangelicals which should rule out some DIY approaches and agree on some parameters arising from an evangelical concensus on the inspiration and inerrancy of Scripture, or is there no consensus on that doctrine among evangelicals? 1) There is an ‘original text’ to aim for in New Testament textual criticism. 2) There is the theological conviction that the preservation of the New Testament is sufficiently reliable. 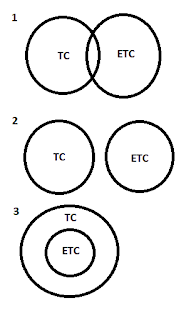 3) The canon of the New Testament is (in one way or the other) a real and given entity. These basic tenets give room for “a variety of approaches” (PJW), interpretations and problematization (cf. the various comments to Dirk’s post). To add my personal thought on 1), I prefer to use the term “initial text.” I regard the reconstruction of the initial text as an on-going scientific enterprise (which is on-going), whereas the acceptance of the simplest working hypothesis, that the initial text essentially represents the autographs is a matter of faith. There are many other related and complex matters; for example, I agree with Ulrich Schmid who has pointed out that we cannot deal with individual writings and neglect that they have been transmitted in collections. At least one person (the collector) has affected the book in terms of editorial activity. In November 2008 I was involved in some related discussions with Bart Ehrman and others on Wieland’s textual criticism discussion list if anyone would want to read. There are two or three relevant threads (“Initial text and exegesis” and “Analogy and internal evidence” and perhaps “99.5% Reliability and the ‘Dark Age’ of the Text”). I suppose you can find them at the bottom of this page. One of the intractable problems in TC research is the Book of Acts. Larry Hurtado has a stimulating post on Rethinking the Text of Acts in light of a recently published 5th century manuscript P.Oxyrhynchus 74.4968 (Gregory-Aland P127), comprising portions of eight leaves preserving portions of Acts 10–12 and 15–17. He refers to the volume by David C. Parker and Stuart R. Pickering in The Oxyrhynchus Papyri, Volume LXXIV, ed. D. Leith, et al. (London: Egypt Exploration Society, 2009) that discuses the manuscript. In short, the discovery shows that the bifurcation between the Alexandrian and Western text of Acts needs to be re-thought since P.Oxy 74.4968 probably shares a common ancestor with Codex Bezae even though the texts are not particularly close. For an introduction to the problems associated with the text of Acts see Peter M. Head, “Acts and the Problem of its Texts,” in The Book of Acts in its Ancient Literary Setting (eds. B.W. Winter & A.D. Clarke; Grand Rapids: Eerdmans & Carlisle: Paternoster, 1993), 415–444. Up-date: There is a scanned version of this paper here (PMH). Baylor University is hosting a King James Bible conference this weekend. Concurrent with the conference is an exhibit showcasing ancient manuscripts and Bibles through the Middles Ages and Reformation and beyond. One of the manuscripts is a newly-discovered (three weeks ago!) papyrus fragment containing a portion of Hebrews 11. It was discovered in a funerary mask and is dated to the second century! I have pictures but I cannot post them here since the manuscript has been assigned to someone for study and publication. Apparently, it seems to be Scott Carroll, Research Professor of Manuscript Studies and the Biblical Tradition at Baylor, who is the scholar in charge of this collection to which I assume the early papyrus belongs. On his webpage we read about Carroll that "He is presently directing the research of some of the earliest-known Greek literary papyri in the world which Dr. Carroll extracted from mummy cartonnage and some of the earliest biblical texts known to-date." In the 1990's Carroll helped Robert van Kampen build the private Van Kampen Collection of Bibles and related material in Florida. Now he is working with another wealthy family, Green, to build up another great collection of bibles and manuscripts to be exhibited in a Bible museum in Dallas. More information about the Green collection in NY Times story here and here (slideshow). One of the MSS they acquired last year from Cambridge was Codex Climaci Rescriptus, which we reported about here (with further links). Apparently, Carroll himself is currently working on a publication of Codex Climaci Rescriptus. In addition to the growing collection, there is the Green Scholars Initiative which has been organized allow scholars to research and produce scholarship around items in the Green Collection. Scott Carroll is Director and Principal investigator of the collection, whereas Jerry Pattengale is Director of the Green Scholars Initiative. While we wait for a scholarly edition of the Hebrews papyrus, hopefully including images, and adequate information about the provenience, we have to be extremely cautious about the claimed second-century date. In the past there have been numerous claims from representatives of collections like these including the Van Kampen collection, and of course there is, coupled with a strong interest to promote the items in the collection, a real danger to through out sensational claims about "earliest biblical texts known to-date," etc (which media just loves). For a discussion of the the "early dating issue" raised by Roger Bagnall recently, see Peter Head's posts here and here. The papyrus is on display at Baylor University until tomorrow. Perhaps some reader of this blog, who lives nearby Baylor could go there and take a peek for us? Any significant readings? J Theol Studies 2011 62: 20-50; doi:10.1093/jts/flr013. The text-critical problem in the very beginning of the Gospel of Mark is both crucial and much debated. The main question is whether the phrase ‘Son of God’ was accidentally omitted from an original or added by some scribes in order to expand the divine name or the title of the book. The disputed words are enclosed in square brackets in UBS4 and NA27 but omitted in the recent SBLGNT edition. Whereas most modern translations and commentators include the words, several scholars have recently argued for the shorter version of Mark 1:1. This article, however, defends the longer version that includes the words ‘Son of God’, taking into account external as well as internal evidence, in particular the plausibility of an accidental omission in the light of scribal habits. The Greek New Testament: SBL Edition. Edited by MICHAEL W. HOLMES. J Theol Studies 2011 62: 288-294; doi:10.1093/jts/flr014. Codex Sinaiticus: The Story of the World’s Oldest Bible. By D. C. PARKER. J Theol Studies 2011 62: 294-301; doi:10.1093/jts/flr015. The Curzon Gospel. Volume I: An Annotated Edition. Volume II: A Linguistic and Textual Introduction. By C. M. VAKARELIYSKA. J Theol Studies 2011 62: 302-304; doi:10.1093/jts/flr039. Watch Dirk Jongkind give a scholarly Easter meditation on P52 on video here. During the recent 7th Birmingham Colloquium of New Testament Textual Criticism, my friend Simon Crisp shared a secret with me. He had recently composed and performed a rap based on Jude (a subject of my interest) in a meeting of UBS Europe Middle East Translation Consultants in 2010. This original performance (the "Ausgangsrap") may be floating around somewhere on Youtube (I haven't found it yet, but here is a nice picture of the author). In 1997, Lauri Thurén wrote an article with the title "Hey Jude" alluding to the classic Beatles tune. The article itself was not supposed to be performed but Thurén did propose that “Jude is … clearly designed to be read out aloud before an audience” (“Hey Jude! Asking for the Original Situation and Message of a Catholic Epistle”, New Testament Studies 43 : 454). Listen up dudes – this is Jude! I’m JC’s man, I’m Jacob’s bro! May mercy, peace and love be yours right up to here! That being a believer means you sometimes have to fight! And they deny JC our lord and master. They still got zapped because they didn’t believe. Until the great day of God’s judgement came. The fire of hell was where they ended up. They even shake their finger at the angels. Instead he left the whole thing to the Lord. They live and die just like wild animals. Remember Korach? Yes, they blew it too. Like stars in the wrong place, heading for darkness. For all the bad things that they did and said. But they like to sweet talk every time it suits! Who do their own thing, making fun of God”. They’re all for pleasure now, and not God’s Spirit. His mercy lasts for ever – don’t give up! JC will always see you through OK.
To help someone and not fall down yourself. Jumping for joy and with your head held high. And so our praise to Him will never end! "The Greek text at the top of your photo no. 0556 reads: ΛΛΥΠΕΧΛΙΡΕΛΒΓΛΡΟΚΛΙΕΙΣΙΩΝ, followed by ΛΛΥΠΕ in mirror-writing. This is a stone tombstone from Madaba in Jordan, precisely dated to AD 108/9, on display in the Archaeological Museum in Amman." One bit of research to do would be to find out when the inscription was first discovered and published. This would be important to help find out whether the items have been available for 100 or for just 5 years. If the findings are genuine they would only constitute the earliest known Christian writings if they were shown to be older than all others. I also find it very hard to see how such texts, if genuine, found without a datable archaeological context could ever be dated as early as Christian documents already known. You can't give an archaeological date to either a flooded cave or to something that's been in the family for 100 years. Now a lot of good scholars will simply refuse to comment until they have seen the artefacts, or until proper information is published. However, I do not think it is illegitimate to comment on what one can see in the photos. This is not to affirm that the artefacts are genuine. The fourth image down here with three binding rings, shows on its third page (i.e. quite well into the book) that an entire page is covered with a picture. Likewise the image at Wikipedia which is of a book with five binding rings similarly shows a middle page entirely dominated by an image. In other words most of what is being shown to us is picture books. 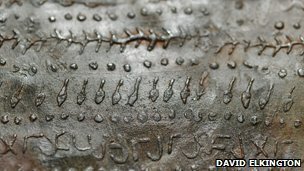 The only bit of writing I've been able to spot was on this photo from the BBC above. What I see, starting second from the right on the bottom line is a jumble of palaeo-Hebrew taw, followed by a misshaped palaeo-Hebrew lamedh followed by a Greek digamma etc. Or it could be a Palmyrene aleph, followed by a Palmyrene nun, followed by a letter which doesn't occur in the Palmyrene alphabet. It could be a previously unknown script or a forgery. However, given the nature of the way scripts evolve, it is very hard to imagine that a group of Christians who fled from Judaea in the first century would use a script like this. If the dots (?) over the fifth and sixth letters from the left are diacritics then the script is probably no earlier than the fourth century. If the script is genuine and is in an intelligible Semitic language, I would predict that the letter like a capital gamma would be a vowel letter, probably waw or yodh. The x letter, which occurs twice is likely to be an aleph or a taw. Any more thoughts on decipherment? Are there any more images with 'letters'?